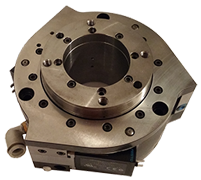 Phi Drive has developed a new generation of high precision rotary actuators. Characterized by high torque/mass and torque/volume ratios, Phi Drive actuators develop a high efficiency without the use of lubricants. 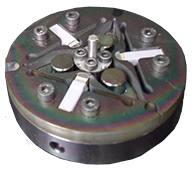 Our actuators work by using innovative mechanisms which have originated a number of patents. The innovation of our mechanisms is based on the exploitation of the elastic deformation of materials. Our selection of rotating drives has a rigid ring at his heart, and piezoelectric or pneumatic actuation systems are used to produce its elastic deformation, which is in turn conveyed into a controlled, accurate moviment. Changing the dimensions of our components, we can develop high speeds and torques, without giving up on a precise positioning. This principle allows a rapid costumization, which let us meet your more compelling requirements. Phi Drive integrated piezoelectric technology in its range of linear positioning stages for high precision applications. 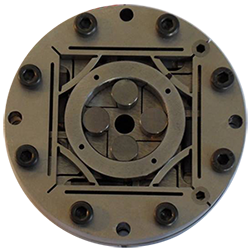 An advanced flexure systems designed through FEM analysis lets our products reach a high level of precision without sacrificing dynamic performances, with efficient and cost-effective layouts. Phi Drive develops gripper and micro-gripper using a piezoelectric core to achieve precise manipulation of small objects. Implementing micro-assembly and micro-manipulation at high dynamic performance for medical and industrial applications has never been easier! Phi Drive is not limited to the development of highly innovative motors and actuators, but also aims at the design of accessories able to satisfy all customer needs.